From deep-diving construction engineers and underwater surveillance vehicles to surfers and paddle-boarders, users of polyurethane foams fulfill diverse subsea and marine applications. Thanks to their unique chemical and physical properties, General Plastics’ specially formulated foams outperform wood and other materials while addressing specific challenges. A Hollywood studio’s special effects team recently enlisted General Plastics’ help with an underwater project. Rather than rely on green-screen technology or computer-generated imagery (CGI), the studio wanted to capture the actual motion of sharks and other marine life in their natural habitats. The special effects team designed a mini rig that would attach to the dorsal fin of these fish and marine mammals with a timed-release adhesive. The rigs contained a small high-definition camera and GPS transmitter enclosed in a waterproof case. Once fitted with the apparatus, the fish would be released into rivers, streams and shallow beaches. After a given amount of time, the rigs would detach from the fish and float to the surface. Led by GPS to their locations, studio staff would scoop up the rigs and use the footage in their films. The special effects team needed to bond the rig to a lightweight, water-resistant material that could accommodate various depths of water. In order to retrieve the rigs, the material also needed to float the rigs up to the surface once released from the dorsal fins. Based on its closed-cell characteristics and flotation properties, our subsea foam was perfect for this project. “We worked with our customer to identify the right density based on the weights of the rig, camera and GPS transmitter, as well as appropriate sealants and adhesives,” said Regional Account Manager Geoff Veld. All of the adhesives the studio team had previously used or deemed acceptable were compatible with our materials. The final material was machined at General Plastics, meeting the customer’s specifications. When delivered, it was ready to bond and required no further post-processing. The only other flotation option for shallow-water applications would have been a much more dense syntactic material. According to Veld, that would have been an overkill as it is designed for use hundreds or thousands of feet below the surface line and due to their density, they are less buoyant. What’s more, syntactic foams are much more difficult to machine and could cause excessive wear of the machining bits because of their glass/ceramic bead fillers that allow them to maintain their strength at such deep-water pressures. “If you’re used to running foam or wood, and you jump straight to syntactic foam as flotation material, there’s a big learning curve in understanding how to keep your machining bits from breaking,” said Veld. Our R-3300 subsea foams also keep objects floating at a specific level in applications such as underwater construction. Those working on oil rigs or building floating bridges can keep their tools within arm’s length because the foam creates a near-weightless effect. It prevents the tools from floating up to the surface or, if they’re heavier, from sinking. Some divers use our foams to operate a large camera rig underwater, making it seem weightless. They can also be part of an automated remote-operated vehicle (ROV) floating a camera through the water. These foams are ideal for charting or searching underwater areas, whether for general exploration, defense or even treasure hunting. Our buoyancy material has also been used in marine-oriented school projects. In 2016, a student-built underwater ROV using our LAST-A-FOAM® R-3315 foam won multiple international awards in the Marine Advanced Technology Education (MATE) competition. The MATE Center’s ROV competitions challenged students to design and build underwater robots to tackle mission tasks based on the real world. The foam was an essential component of the team’s ROV, which needed to provide sufficient buoyancy at the bottom of NASA’s 40-foot deep Neutral Buoyancy Lab (NBL). 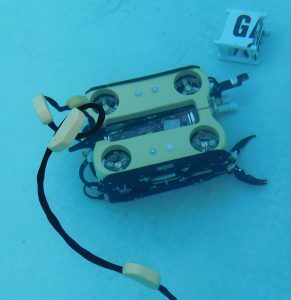 The Seattle-based team composed mostly of high school students performed calculations to determine the correct amount of flotation for their vehicle, which they used to manufacture a float that was mounted on the top of their ROV. The team credited our subsea foam, along with our technical help throughout the design process, with their success at NASA’s NBL and contributing to their ROV’s professional look. This subsea foam is tested to perform down to 1,200 feet, uncoated, and to 2,400 feet, coated. The 12-pound density is typically used in very shallow applications or in products without a lot of weight. The higher-density foams can survive the pressures in deeper waters when coated with poly urea or another layer of polyurethane, potentially doubling their hydrostatic pressure resistance. In buoy-type uses, these polyurethane foams are far preferable to wooden floats or other materials that can be damaged or warped by water, salt and weather conditions. While water absorption is negligible and the foams are rugged and highly durable, it’s still advisable to apply a coating to protect from UV energy for longevity. Delivering value to customers extends beyond product formulation and selection to streamlining processes. One of our boat-builder customers had previously used a three- or four-step process for creating its tooling molds. “They were making monolithic tooling to produce large shells for different hull designs. Essentially, they would cut one layer, measure it, add a putty or epoxy resin to the outside, and then add another layer of a slightly higher-density foam that could be used in conjunction with a fiberglass layup,” said Veld. Employing smaller test models, our experts evaluated their material cost, processing time and the impact on the consistency of the finished product. After seeing the advantages of using a homogenous molding solution, our customer changed course. Now they use our LAST-A-FOAM® FR-4500 tooling material (12- and 30-pound densities) in place of three or four materials, saving them about 20 percent in time and 5 percent in overall cost. They make their tools out of the foam, bond it, sand it and cut it to size, then lay up right on our foam material instead of creating a plug out of other foam materials for a layup. Further, there are no abrasive fillers in the polyurethane foam, so it’s easily cut, filled and sanded. The product also readily accepts virtually all bonding agents and sealants. Customers appreciate the wide range of options to achieve their desired value and surface finish. A 30- or 40-pound material will require minimal sanding but result in a much heavier tool, while a 12- to 15-pound density will result in a lighter product but need more time sanding to achieve the same finish. A Washington-based yacht manufacturer utilizes our rigid, flame-retardant LAST-A-FOAM® FR-6700 foam series in composite applications as a wood replacement for its custom-designed ship interiors. These mid-range materials in densities ranging from 15 to 25 pounds are used for everything from drawers, cabinets and tabletops to moldings. Typically, the foam is wrapped in fiberglass/resin or wrapped in a decorative vinyl to provide a more attractive, finished surface. Because FR-6700 doesn’t absorb saltwater, it doesn’t swell or warp like wood in a marine environment, offering greater dimensional stability and durability in a composite panel. When it comes to water sports, our polyurethane foams ably fit the bill from oars to surfboards. We helped one customer profitably expand their product line. Our foam products were used as core material over the years for various paddle and oar designs, but they sought to expand their offerings by capitalizing on the craze for stand-up paddle boards. The customer came to us for a better solution after they had tested five or six different wood, foam and plastic core materials. Ultimately, they found the greatest value in using our LAST-A-FOAM® FR-7100 Multi-Use Foam Series in the four-pound density as the composite core material for their paddle boards. A lightweight product offering closed-cell properties and a lower cost than other wood alternatives, it also offered the opportunity to maximize their profit. Many of the products for stand-up paddle boards are encased in fiberglass, so they don’t typically require a flotation specific-material like our subsea foams. In the case of LAST-A-FOAM® used as core material, a fiberglass failure will have negligible impact on this board since it is a closed-cell foam. It will not absorb water or warp. Moreover, the FR-7104 foam is much lighter than wood and more compatible with lay up resins than Styrene based foam cores, making it easier to manufacture resulting in a lighter board to transport and float. Beyond supplying polyurethane foams for use in these diverse applications, we offer in-house CNC services and assistance with projects and technical questions from our expert custom solution representatives.